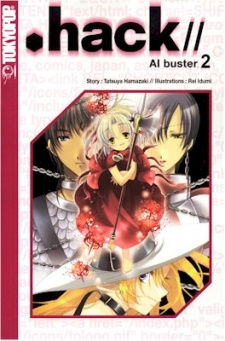 AI buster, the prequel to .hack//SIGN, is the story of Albireo,a debugger, who used to play ‘Fragments,’ the beta version of ‘The World.’ Albireo encounters Lycoris, whom he assumes is an event NPC (an AI character) but she’s actually a failed version of Aura. She is blind, deaf, and mute, because Albireo debugged her and broke up important files. The missing files are hidden as items in the World, and when returned to Lycoris, she gets a function back. When she gains them all, she changes into a teenage form with purple hair who looks like Aura. Because of his acquaintance with Lycoris, Albireo cannot log out of the game and exit the World.